Another spinach salad? Yes, sorry. I couldn’t help myself. Homemade salad dressings are in my top favorite food items. They tend to be inexpensive, super fresh and the flavor options are unlimited. I also like that I can control the calories by what I add or leave out. This particular honey mustard vinaigrette adaption from Vegetarian Times Fast and Easy is one of my favorites. Place all the ingredients together in a vinaigrette bottle and shake well to combine. This recipe was written as a side salad for six, but serves about three as a main course. For a vegan version leave off the blue cheese and add extra sunflower seeds and apple slices. Divide spinach among 6 salad plates. Evenly divide the toppings and drizzle with dressing. Servings 6. Per serving 149 cal; 4g prot; 11.5g total fat (2g sat. fat); 10g carb; 4mg chol; 309mg sodium; 4g fiber; 7g sugars. Recipe adapted from "Vegetarian Times Fast and Easy". Photo by Laura Flowers. YUM! This is exactly what I would eat right now if I had spinach and sunflower seeds! I would change out the blue cheese for goat cheese or feta as I'm not a huge blue fan, but I can't wait to try this! I will be visiting the grocery store tomorrow. Spinach is one of my favorite salad greens so bring.IT.ON. And homemade salad dressing is the only way to go! Love this! 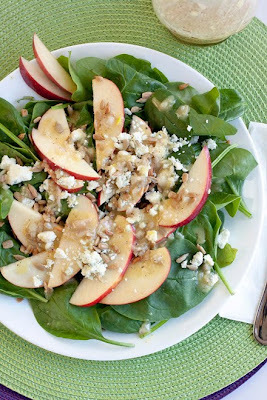 I love the flavor of baby spinach in salads -- the honey mustard is one of my fav dressings too. This is just the salad for me! It is so hot here, Laura....we need all the salads we can get! I love making my own dressings too, and I don't do it nearly enough. This salad would make any greens-loving person happy! Thank you for sharing yet another creative and delicious eat. I hope you have a wonderful end to your work week. I wish tomorrow was Friday but it will get here soon enough! I never really get sickof salads... or spinach. No need at all to say sorry Laura! !This sounds so good and sooooo refreshing. Ooo it looks so easy and flavorful! I love spinach salad and love your blog! I'll be back for another visit soon. There is nothing wrong with another spinach salad. Can;t have enough of good salads as far as I'm concerned! We love salads at our house, and it's a good way to eat our spinach:) I love that you can sort of clean out the fridge by throwing whatever you want into a salad. I think it's time to finally use my shaker bottle to make my own dressing. Thanks Laura...you keep me healthy, lol!